These were good reheated if you don't want to eat 18. The sauce was fantastic, too. This is my first post from the kitchen table in the country. I just had the wonderful folks from Eastlink in to connect me to the outside world. What a relief. I feel less “alone.” Isn’t that weird? The following recipe is one that I made about a week ago. I was saving it for a day when I couldn’t cook (like today). I hate to have my readers go a day without a “feeding” of my scintillating and sparkling prose. 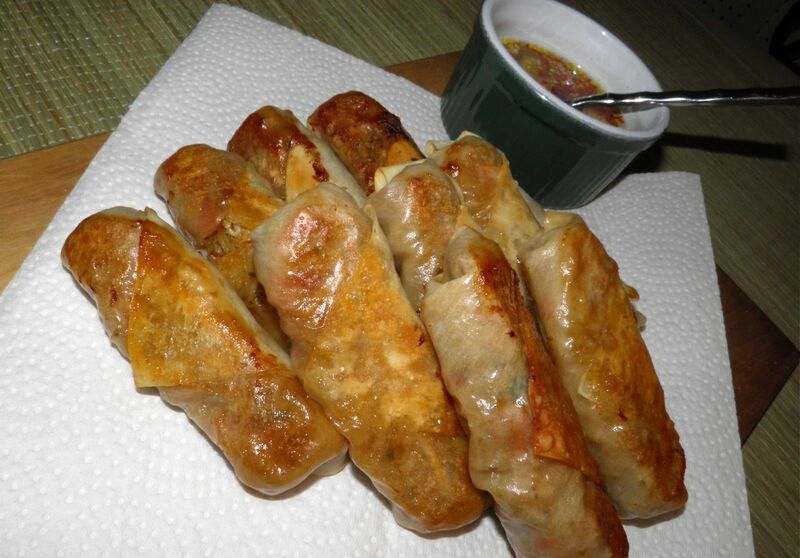 I’ve wanted to make homemade egg rolls for quite a wile. I’ve made fresh spring rolls before, which are amazing, but they require no cooking. This recipe is a combination of one I found online (for technique only) and my own filling. They're bakes, so supposedly they're healthier than fried. The technique is the most important thing to understand. Now I can make any type of egg roll I want. This recipe uses shrimp, but it would be just as easy to substitute beef, or pork, or just veggie. You could also throw in things like shiitake mushrooms, five spice powder, ouster sauce or hoisin. Maybe even teriyaki. An important thing to remember is to keep the filling veggies on the crisp side and don’t let the filling be too wet. Wet filling will soak the wrappers and make the rolls soggy before they have a chance to crisp up. These really aren’t a lot of work as far as “filled things” go. Now tortellini – they’re a lot of work. This would be fun if you had guests in that like to help in the kitchen. Give them a try. They’re not the grey filled things you buy. That’s for certain! then roll from the bottom toward the top. Easy. Bring a pot of salted water to a rolling boil Add the shrimp and cook for 2 minutes. Remove and let cool until easy to handle. Peel and chop. In a wide sauté pan heat the oil. Sauté the onion until it turns translucent, but do not allow it to brown. Add the garlic and ginger and cook for 30 seconds. Season with the black and red pepper. Add cooked shrimp and combine. 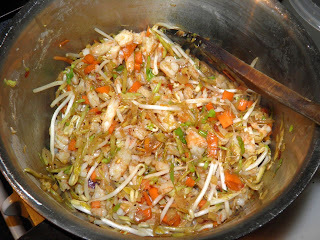 Add in soy sauce and cabbage, a handful at a time, mixing well after each addition. Once the cabbage has barely wilted, add the bean sprouts and remove from the heat. Lat a wrapper on a flat surface. 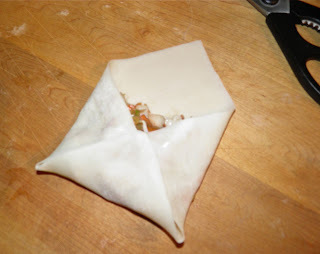 Place 1/4 cup of the shrimp and veggie mixture on the centre of the wrapper. Fold in the left and right side corners towards the centre, and then fold up the bottom corner (see photo). Brush the top corner point with a wet finger. Roll from the folded bottom up, tightening the filling inside as you go. Place seam side down on an oiled cookie sheet. This next step is easiest done with a spritzer bottle with oil. Sprat the top of each roll with oil. If you don’t have a spritzer, brush the tops lightly with oil. Bake at 400°F for 15 minutes until the underside is browned. Turn and bake for a further 15 minutes. Let cool slightly before serving. They’re very hot inside. Serve with the following dipping sauce. It’s pretty authentic. 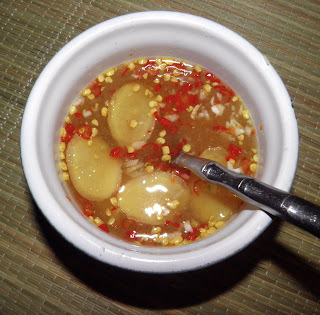 Combine the lime juice, sugar, water and fish sauce. Stir until the sugar has dissolved. Add the garlic, chilli and ginger and set aside. This is best if you let the flavours meld for about 1/2 hour.